It’s now 44 hours after I crossed the finish line and I sit here with considerable pain in most leg muscles and my right foot is somewhat strained too. The training build for the race was too short in duration and the long runs were also too short in time and distance. On the morning of the race I had resigned myself to the fact that there would be no silver medal (Sub-2:15 time) so I decided to enjoy the race for as long as possible, dig deep when the time came and leave nothing out there. The race started and the first surprise came early; after running at sub-4:00 pace for the opening section of the race, it still took five minutes to cross the 29km to go marker which meant I was 30 seconds off sub 2:15 pace already. I later found out that the race was actually 30.25km long and the first marker comes after 1.25km… Once I realized that I was behind I then decided to leave the watch alone and just run on feel. Even though I was feeling pretty good I guessed that I was running as close to threshold as was possible – which was the plan. The next time I looked at my watch was at the 15km to go marker; I crossed this in just under 1:05:00 which was a great surprise to me, it made me feel both good and bad. Good in the sense that I was on for sub-2:15, bad in the sense that I now had a pace determined for me. I knew that the next 4 kilometers was the most difficult section of the course so I decided to run the next 5km without looking at the watch and then assess the potential workload for the remaining 10km. The 10km to go point came just after 1:27:00 of running – that left me 48 minutes to cover the last 10km. I was fairly sure I was going to go under 2:15 at this point but still unsure how Grönstabcken, Abborrbacken and Karinsbacken would effect me. It took me 46:22 to run the last 10km putting me well under the time needed to get the silver medal: 2:13:40 – almost exactly six minutes faster than my previous PB. My season is over – time to get back into the gym and put a little muscle on my little frame. 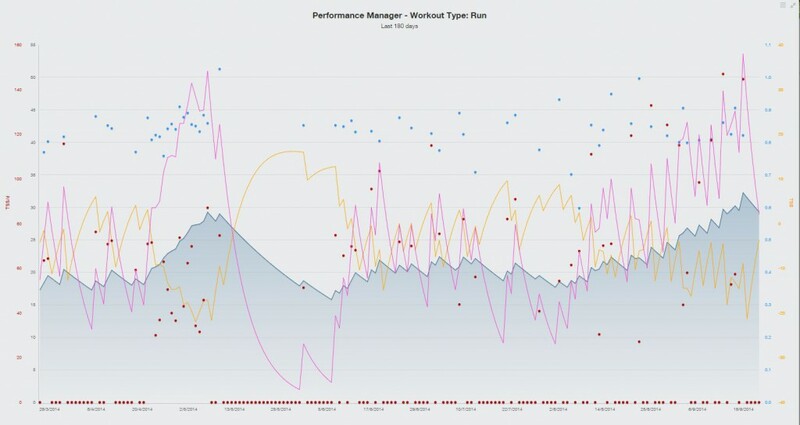 Performance Manager for just running. So my running form is the best of the year… but how good is that? 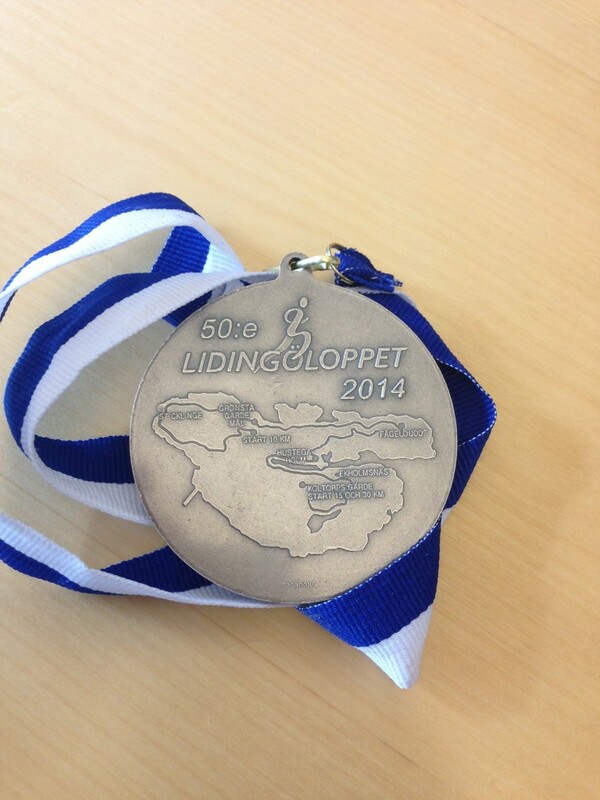 All my runs are done for Lidingöloppet – one 50 minute fast run tonight and I’m done. I’m still a little shocked after my reconnaissance of Lidingöloppet, nonetheless I’m going to get a three more sessions in my legs and then taper down quickly. Yesterday, after one days complete rest, I headed out to the Ursvik 5km trail and did 8 hill intervals. They were difficult and did feel progressively more difficult with each one but the times decreased – so I’m not as bad off as I thought. 1 x 13-15km M-Paced run. Taper down for 6 days. Race as fast as I can. I’m many things today after the reconnaissance of the last 22km of the course. Worried, humbled, tired yet glad I did it. The goal of a silver medal time has now been relegated to dream status – I just don’t see how I can do it with my current fitness. I pulled the table below from the web; it shows the splits of a person who went sub 2:15. With my lack of distance training, I’d want to be even faster for the first half – probably around 1:04:00 (4:16/km). As I said earlier, just a dream. I did my ‘long’ run yesterday and today my cold is no better and no worse – which is good. To add to the good news, the run was 2 minutes quicker and 5 bpm lower heart rate than the last time I did the same run. To further add to the positivism, I felt good after the run – unlike the last time I did it when I was struggling to hold 5min/km on the way back to work. All in all it was a goo day’s work. I have about nine days to add more work and then a 10 day taper. I have a mild cold; slight tickle in my throat and not much else. I rested yesterday in an effort to make it go away before I ran again. It has not subsided but I think I’ll go now and run… there is no plan for this run except that I will not over-do it. If I feel weak, which I shouldn’t, then I will take the quickest route home. I backed up my long run with a fast 5km the next day. I felt good during this run but kept it short since I had planned to do a second long run the following day. I started the long run the next day and felt bad quite early into it. I stayed at it hoping that it would come good but it never did. I turned around and headed for home with a slow 10km under my belt. I then decided to hit the MTB trails on the way home and crashed… Sore right upper quad. Next day my right knee was sore – I assume the quad was pulling on it due to the injury. I did some very light stretching and decided to rest until I felt good again. I did another XC run today. This time on the more challenging Ursvik Extreme plus a 2km add on each way, bringing the total up to 19km and some change. The plan was to run easy and hold form; it’s all about getting the distance in and being able to train again the next day. Even though I was running easy I was extremely fatigued at the end. The relentless hills take their toll regardless of my pace. The outline plan that I wrote has already been broken… let’s see how I do in the coming days. Still not giving up! Waiting for some running form to appear. I’ve been relatively patient, careful and determined but there is still no sign of that sub 2:15 Lidingöloppet form appearing. With 26 days remaining and one of those days being Stockholm Half Marathon, I feel I have a small chance of doing what I want to do. My current think is that if I don’t get very comfortably under 1:30 then there is no chance of a sub 2:15 on the island of Lidingö. Following that, the decision then becomes: do I want to go through all that pain on race day for ‘the usual’ result? I’m not too sure to be honest.